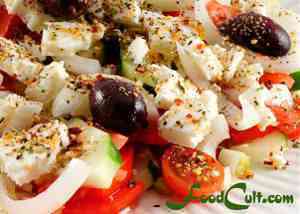 Galganov's Free and Easy Recipe for the Instant Greek Salad! starting with two medium sized tomatoes would be the foundation for a nice sized dinner salad. Decide the proportions for yourself - your tastes and appetite. Let sit to blend flavours - then drizzle generously over salad. Wash and slice tomatoes and lay them out on the dinner plate. Clean and slice cucumber into half-moons and lay them out on the dinner plate. Slice onion rings, then halve those rings and lay the pieces out on the dinner plate. break the feta cheese into pieces or crumble it (as your preferences dictate) and spread it over the salad. place olives around the plate (six is a generous number of olives for a dinner plate sized salad but assemble this salad to your preferences). Sprinkle your favourite Greek seasoning mix generously over the entire salad. The range of flavours will affect anything the bits touch and get wet on. Drizzle your favourite extra virgin olive oil all over the salad and seasoning. Make a mixture, in advance (a day or even more is good to allow the oil to take the flavours of the seasoning), of your favourite extra virgin olive oil generously prepared with your favourite prepared Greek seasoning. Keep left-over dressing for another serving. Some Greek seasoning mixes may benefit from the addition of a bit of finely diced, sun dried tomatoes. This is a good time to add a some if your seasoning mix hasn't any. (Store at room temperature). From room temperature, spoon the prepared oil/Greek seasoning mixture generously over the salad. The City of Montreal was, in part, about great food. Our favourite Greek restaurant made a very simple Greek salad. The spices in the dressing were a delight and we thought, "This is so good, this HAS to be Greek Salad." They served their salads with a basket of toasted French bread - it would absorb the savoury dressing elements and bits of Feta cheese left over in the plate. It was a delightfully simple salad of tomatoes, cucumber, onion slices, feta cheese and black, kalamata olives. Usually the onion slices were from red onion but sometimes they were not. We recently acquired a bag of young, vidalia onions. They were wonderful, gently flavoured onions and contributed nicely to the salad. Today, this salad makes a great, quick snack or light meal. We usually enjoy it with our own, home made pita and a local sheep's milk feta cheese. Sometimes we "instant" it up by using a prepared Greek spice but more often, these days, we just prepare the quick dressing from fresh or dried herbs as explained to the left. Either way, it's fast, easy and tasty! Some people believe Greek salad needs a vinaigrette. We do not. We think there is enough acidity in the tomatoes and enough sharp taste from the onion. We prefer a simple, extra virgin olive oil dressing. This is a fantastic dish particularly at the time of year when tomatoes and cucumbers are so abundant in the stores or, better yet, in your garden. We use any tomatoes that are ripe. Our Greek Salads may have some cherry tomatoes, some romas, orange tomatoes, red, yellow or black. It doesn't matter. Even the subtle variations in flavours of different varieties of tomatoes may contribute to the salad. Enjoy this recipe with fresh, home made pita or with a slice of lightly toasted bread from any one of our bread recipes!